Do I Need a Ghostwriter? You’ve heard the term “ghostwriter” in relation to books before—maybe suggested by a friend or discovered in an online search—but you aren’t sure what it is or if you need one. The short answer to the first question is, a ghostwriter is a professional writer who takes a client’s ideas and turns them into a polished, engaging, and marketable book. The ghostwriter receives no cover credit or royalties for her work, allowing the client to build his/her brand and platform and reap the benefits of his/her story or idea. However, in exchange, a ghostwriter is paid far more than a writer with a byline. That is why you need to first determine if you really need a ghostwriter for your book. 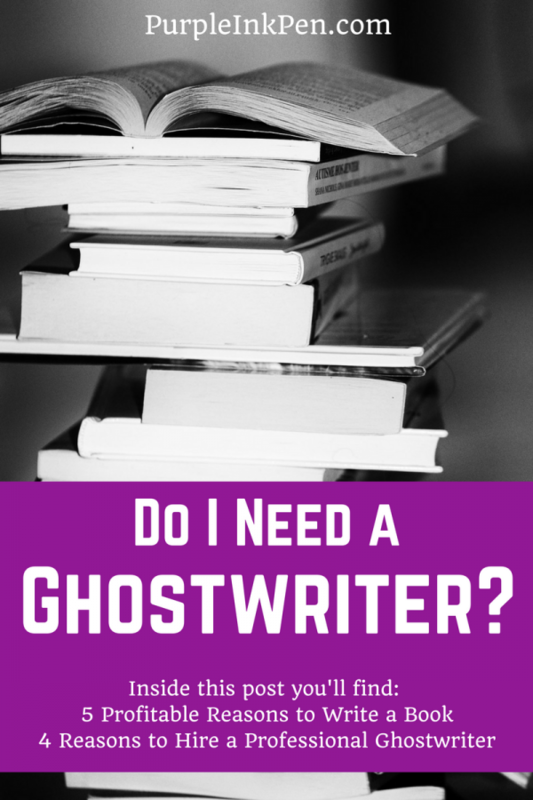 So why might you need a ghostwriter? First, you must determine why you want to write a book. Perhaps you’ve seen a trend in your industry or on Barnes & Noble shelves that you’d like to take advantage of. Maybe that story idea that came to you in a burst of inspiration jives with what’s popular right now. Maybe you have a lot to say about a topic that is highly relevant and sought after. If you think your idea could be profitable, but you are unsure if you can fully bring it to fruition, it may be time to look for a pro. Remember, good ghosts aren’t cheap, so be sure you’ve done your research on your story/idea’s marketability. If you’re a public speaker or figure of any kind, adding a book to your repertoire can be a great way to generate more passive income. Maybe you’re an entrepreneur with a killer business strategy. Maybe you’ve spoken about it at conventions and written some blog posts, but you’d love to get the whole process, complete with your personal story and all the minor details, into a comprehensive book to pass out at all of your appearances. Building your platform and expanding your brand brings you more business and income in the long-term, so an investment in a ghostwriter who can make a book that delights your target audience is well worth it. This builds off of number two. You’ve heard the old saying, “He/she wrote the book on ___.” Writing a book based in your field is a sure-fire way to make readers, clients, and colleagues view you as a pro in your select area of study. Do you work as a consultant? Do you apply for grants for your research? Want more clients flocking to your site and company for advice and services? A book is a great way to turn heads and bring in more business, so making the investment in a ghostwriter who can compile all your knowledge and the latest research into a book that bears your name is likely to pay off. A family history is a largely sentimental investment, but that doesn’t mean it isn’t a good one. Imagine having a book to pass down to your children, grandchildren, and great-grandchildren detailing your family legacy. Maybe you want to write a memoir. Maybe your personal experiences could help and interest others. Everyone has a unique story to tell, but if you want people to pay attention, it must be written with flair, beauty, and skill. A company history is great to have for sale or even for free in your lobby. Let your clients feel close to you, understand where you’ve been and where you’re going. Books in this category aren’t usually huge money-makers, but they have value all the same. Do you have a unique perspective on a serious issue? Do you have a solution to a major problem afflicting a select group of people in today’s day and age? Self-help and how-to books are highly marketable. Just look in the bestsellers section of your local bookstore. People love to learn, and books are still the authority on learning, even if they’re digitized. If you have a message you’re burning to send, if you think your methods for solving a problem could help lots of people, you have a solid reason to write a book and potentially invest in a ghostwriter. If your reason behind writing a book falls into any of those categories, you have yourself a worthwhile and potentially profitable motivation. Writing a book is an investment no matter how you do it. It’s an investment of time first and foremost, not to mention hard work. If you want to publish traditionally, it’s a serious investment of patience and strategy. If you want to self-publish (and do it well), it’s a serious monetary investment, but you’ll reap all the profits. 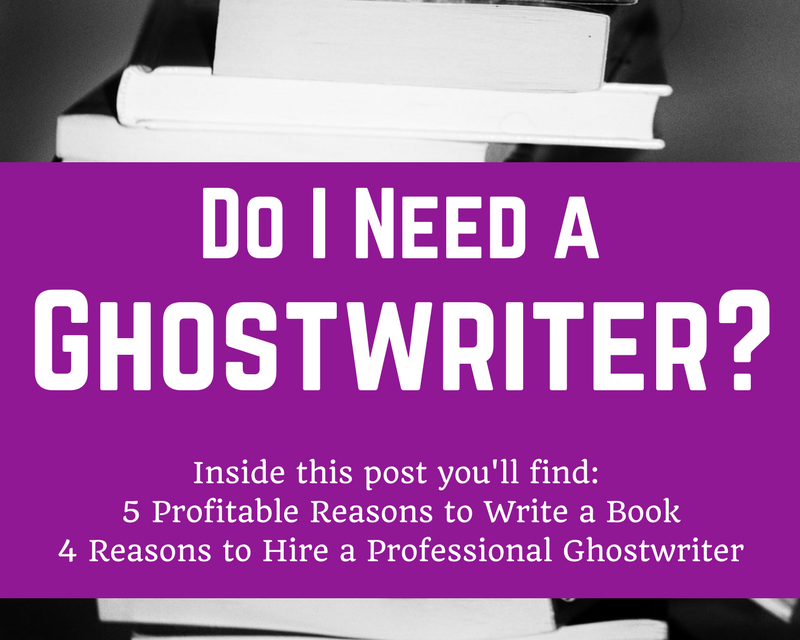 So how do you decide if you want to add the cost of a ghostwriter to your investment? Writing a book is a huge undertaking. In nonfiction, you must not only research your topic, but you also need to research your target audience and their needs, the market of your topic, and, if you want to traditionally publish, agents and publishers that represent books in your genre and what they are looking for. Then you have to outline the book in a cohesive, logically sound way that will take readers naturally and smoothly through your content. Only then does the real writing even begin. It must be engaging, interactive, and it must have a tone, voice, and style tailored to your audience. Then, once you have the first draft done, you have to go back and edit everything, often multiple times before you get it exactly how you want/need it. You can’t do it in a few weeks. If you’re a busy expert with your fingers in multiple pies, you probably don’t have the time for all of that. Fiction is no better. Before you actually start writing the book, you must have at least a basic idea of plot. You need to then thoroughly outline your characters. You need to understand their personalities and motivations so that you know just how they will react to any plot point. You must define backstory, even if it never actually makes it into the final manuscript, because it all speaks to motives and actions. If you’re writing something like a mystery or thriller, you need the plot outlined in deep detail so that you don’t fuddle your clues, leaving your audience either completely confused or bored because they figured out the twist a long time ago. If your story needs to take place in a fantastical setting or in a setting you are unfamiliar with, you must conduct research and build a world from scratch. If there are technical details in your story, those must be researched for believability. Then you have to actually write the thing, and then reread and edit until all holes are filled, all dialogue is sound, and the readers get their proper catharsis at the end. It’s perhaps an even larger undertaking than nonfiction. Chances are, if you are looking for a ghostwriter, creative writing isn’t your full-time career. You have life and business to attend to. Do you have time to take all the necessary steps to make your story shine? Writing is an art form. No ifs, ands, or buts. It takes years of practice, not to mention raw talent, at least if you want to produce books that make people feel strong emotion, take action, and reread your content again and again. If you want to produce a book that people recommend to their friends, it requires skill and dedication to the craft. If you’ve never written more than a newsletter or a few blog posts, you definitely need a ghostwriter if you want to generate any sort of profit or dedicated readership from your book. Even if you’ve dabbled in creative writing endeavors as a hobby, writing great short stories and poems, and even if your blog posts draw in large numbers of readers and earn subscribers, writing a book is a whole different monster. Many good writers stumble on their first book project. They lose enthusiasm halfway through and get discouraged. They get lost in the sheer size of things and begin to doubt their skills. So, even if you are a writer, if this is your first book, a ghost is still a viable option, especially if you’re also short on time. If you’re a writer yourself, don’t feel like you have to let go of the reins and let the ghostwriter write the whole book. Ghostwriters are more than happy to write alongside you, helping you keep moving forward when you get stuck, providing solid feedback and rewrites, and writing chapters that you don’t have the time or patience to deal with. If you contribute to the writing process, you’ll also get a lower rate. A ghostwriter must be familiar with all branches of the publishing industry in order to develop a successful career. But this knowledge is not something everyone has. If you need guidance on the publishing industry and/or guidance on how to make your book marketable in the industry, a ghostwriter is a great source of knowledge and help. Most ghosts have a consulting rate, even if they don’t list it on their site. If you want some initial consultation before you begin writing, don’t be afraid to reach out to a ghostwriter. Who knows, you may want to delegate some of the actual writing work to them when you get busy or stuck, too. Maybe you are confident in your ability to write a book, but you want to reach out to traditional publishers to gauge interest in you and your topic first. In nonfiction, it is customary to send out proposals to publishers for consideration before actually beginning the writing process. Most nonfiction publishers won’t accept full manuscripts in the initial consideration phase, just proposals, so many writers work up the proposal before ever setting fingers to keys on the manuscript. But that is a very stylized writing form. It has a set format. Perhaps you are not comfortable with that. A ghostwriter can help. Just make it clear, if you are planning to actually write the book yourself without help, that you only need him/her for the proposal. If you hire a ghostwriter for any nonfiction project, he or she ought to first ask you about how you plan to publish, and if you say “traditional” he/she will make the proposal the first step of action. Whether or not the ghost does this is a solid way to gauge their knowledge and experience level. Even fiction agents and publishers want a formal synopsis of a novel before they take it on. You often send the first few chapters and a synopsis (you are expected to have the full book already completed). If you need help with that synopsis—which should identify your audience and market, detailing your personal platform, etc.—you can hire a ghost for that, too. A professional and proficient ghostwriter is a big investment, but if you have a solid, marketable motivation behind writing your book, that investment is far more likely to pay off. You should be wary of any ghostwriter willing to write a standard 50,000-75,000 word book for a few hundred dollars. That person doesn’t understand their worth, so how can they understand the worth of your business, vision, or story? That, or they can’t justify pro rates because they aren’t at pro level. If you’re going to invest, invest in the best. Finding the right ghostwriter for you is a whole other task. If you think a ghostwriter is the right option for you, check out these tips and tricks for selecting your ideal ghostwriter.